Very mild temperatures exist today in in the Rockies and central Plains, but drastic changes are on the way. In fact, a potentially historic April snowstorm is on the way for parts of the central and northern Plains from later tomorrow into Thursday. An upper-level trough of low pressure is working its way onshore today in the Pacific Northwest and it will intensify as it digs into the central Rockies by tomorrow. Colder air will flood the middle part of the country as surface low pressure intensifies on Wednesday – aided by a powerful upper-level jet streak - and snow will become heavy over the northeastern part of Colorado and then spread into the central and northern Plains. 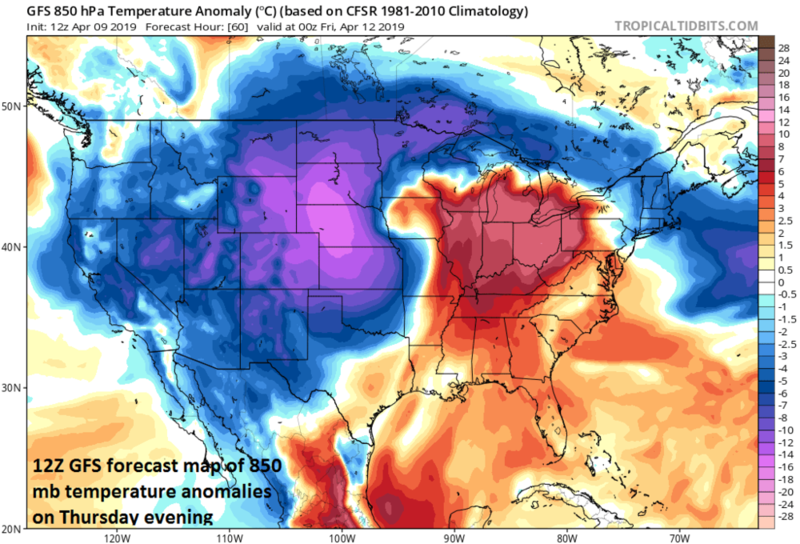 This unfolding storm system could become so intense - perhaps as low as 28.90 inches - that it could flirt with the all-time low pressure record for the month of April in parts of the Plains. The heaviest snow axis will extend from around Denver on the southwest side to Minneapolis on the northeast side with several inches of snow expected in these two metro regions and 1-2 feet possible in between. Some of the areas that have suffered with flooding in recent weeks will likely see rainfall initially from this system before a changeover to heavy wet snow and this won’t help the overall situation. The serious flooding in Nebraska during recent weeks was caused by a combination of excessive cold this winter, excessive snowfall, and grounds that remained frozen just below the surface level when the snow melting season got underway.